It started with five words Teresa typed on her Facebook Page. “I think we should March”, posted the midlife woman from Hawaii, before going to bed. Spawned by dismay and shock on the night of the US election, that rise to protest today became a full-blown world movement. Hundreds of thousands, of very ordinary women, of all ages and colors, and from all walks of life, congregated today for the Women’s March on Washington, protesting the inauguration of Donald Trump. Some men joined in with their daughters in strollers or baby carriers, but the mood was definitely feminist and female. “We march for our daughters, granddaughters, our sisters and all people who want a fair, just and inclusive world”, said a woman who had woken in the early morning darkness to ride a bus for six hours to get to Washington. With 657 sister marches in the States, and hundreds more around the world, in places like Vancouver, where I live, to Mexico City and Yangon, Myanmar, over a million people around the globe showed their concern about the new U.S. president and his policies. Today, indeed, was a day for the history books. What began as an anti-Trump protest really broadened to include preservation of reproductive rights, freedom of race and religion, inclusion of minority/LGBTI groups, and protection of immigrants who face new persecution in America. In whirling snow in Wisconsin or under waving palms in Mexico City, women spoke in solidarity for inclusion, saying this is what democracy looks like. United, they stand for a world that respects all people. Staying home wasn’t an option, and in Canada, where I live, thousands of women could be silent no longer. The greatest feeling, personally, was knowing there are so many other women who have been feeling as concerned as I have, as I listen, quite terrified, to the new tone of white male power that Trump is tweeting. From foreign policies to environmental concerns, the list grows long, with women’s rights tugging the hardest at my heart. I know full well the struggle my mother had: never paid an equal wage for equal work, or having to quit her job, when her belly betrayed her, with my growing size. My generation reaped the benefits of the feminist movement that was burning bras while I was playing with my anatomically incorrect Barbie doll. Yet I also know firsthand, how fragile these hard-won rights, are. How ceilings are still made of glass and how ageism (I’m now in my 60’s) is the next frontier for women to truly be considered equal. What we won can easily be trampled, even erased. My daughter, who is just becoming a young women herself, woke me this morning from her college, far from home and three hours ahead, to excitedly send me a video of the early crowds of women congregating in Washington. This evening, she texted “I feel energized. Millennials,” she explains, “are thrilled to finally have a chance to act like our older sisters of past generations. 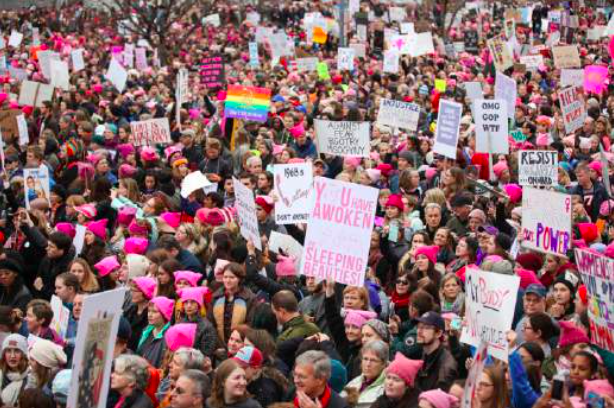 In our world of non-tangible acts [which she explains is social media], it made a huge impact seeing thousands of women in the street, marching”. The physical act of marching in solidarity is unifying, in this world of disassociation from each other. I get that. She also was raised to believe in all earnest that her body is her body and only her body. “The thought that someone else (let alone a white man in a position of power) could do otherwise is very frightening”, she wrote. Millennials also like what they term the “intersectionality” of this growing movement. White women holding signs for Black Lives. Gay rainbows in one corner of a sign, “No human being is illegal” underneath. They are taking up each other’s cause, and becoming much more than a suffragette redo in the process. We will need a unity of epic proportions, if we are to put this Genie back into his bottle.